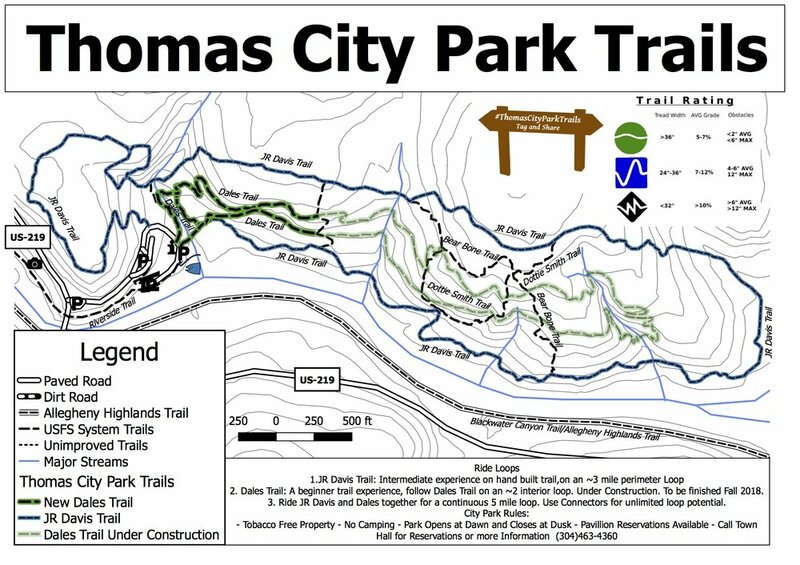 New Historic Thomas is raising funds to construct a 2.4 mile easy, green, sustainable, multi-use trail in the Thomas City Park Trails System. These trails will especially provide beginner and children mountain bikers a trail to learn proper biking technique, gain confidence in their abilities, and enjoy their time in the woods. It will also provide an enjoyable trail for any level rider just a short distance from downtown Thomas. Making Thomas a more hospitable place for all riders, whether residents or tourists, will promote healthy livelihoods for Thomas residents and will also positively impact the small business economy of downtown Thomas. As of September, 2018 the beginner mountain bike loop is open to riders! Make sure you check it out. Funds raised as of 12/5/2018 = $30,526! Make your secure tax-deductible donation using the Paypal link at the top of the page. $16,800 - Clean Rough-In: We've Got the Trail! ...and all those who dropped money in our donation boxes! Follow the project's progress on Facebook and Instagram!